Yesterday, my faith in the United States Food and Drug Administration (FDA) was renewed just a little bit. The FDA ruled negatively on a petition by the Corn Refiners Association (CRA) to change the of High Fructose Corn Syrup (HFCS) to “Corn Sugar“. Unfortunately this decision was not based on health and disease concerns for all but fear of confusing consumers. The FDA stated that the name change “could” put some consumers at risk but mostly cited confusion as the reason for denial. It took the FDA 20-months to make a decision! The Food and Drug Administration (FDA) today denied a Corn Refiners Association (CRA) petition to rename high-fructose corn syrup “corn sugar,” saying the action would only serve to confuse U.S. consumers and could even pose a health risk to those suffering from fructose intolerance. Disappointingly, the FDA did not recognize the potential health risks to all consumers from HFCS consumption. First, you contend consumers are confused by the name “high fructose corn syrup” and that the proposed alternate name “corn sugar” more closely reflects consumer expectations and more accurately describes the basic nature of HFCS and its characterizing properties. You base this on the following: You state that HFCS and sugar are equivalent by every parameter of relevance to consumers, for example, that they have equivalent ratios of fructose and glucose and both are metabolized similarly in the body. Based on a consumer research study, you state that many consumers are confused by the name “high fructose corn syrup,”that consumers incorrectly believe that HFCS is significantly higher in calories, fructose, and sweetness than sugar, and that the term “corn sugar” more accurately reflects the properties of HFCS based on consumer ratings of this alternative name on these attributes compared to sugar. You cite other evidence of consumer confusion regarding the characteristics of HFCS. 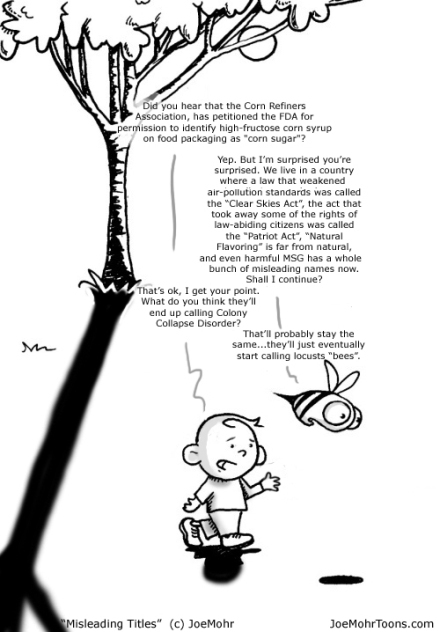 You also state that the name “corn sugar” as an alternate common or usual name for HFCS fully satisfies the criteria for common or usual names under 21 CFR 102.5(a) because “corn sugar” accurately reflects the source of the food (corn), identifies the basic nature of the food (a sugar), and discloses the food’s function (a sweetener). However, FDA’s regulatory approach for the nomenclature of sugar and syrups is that sugar is a solid, dried, and crystallized food; whereas syrup is an aqueous solution or liquid food. FDA’s regulations permit the term “sugar” as part of the name for food that is solid, dried, and crystallized, specifically the standards of identity for dextrose monohydrate (21 CFR 168.111) and lactose (21 CFR 168.122), and the GRAS regulation for sucrose (21 CFR 184.1854). FDA’s regulations provide for the terms “syrup” or “sirup” for food that is liquid or is an aqueous solution, specifically the standards of identity for glucose sirup (21 CFR 168.120), cane sirup (21 CFR 168.130), maple sirup (21 CFR 168.140), sorghum sirup, (21 CFR 168.160), and table sirup (21 CFR 168.180). FDA’s approach is consistent with the common understanding of sugar and syrup as referenced in a dictionary. Consequently, the use of the term “corn sugar” for HFCS would suggest that HFCS is a solid, dried, and crystallized sweetener obtained from corn. Instead, HFCS is an aqueous solution sweetener derived from corn after enzymatic hydrolysis of cornstarch, followed by enzymatic conversion of glucose (dextrose) to fructose. Thus, the use of the term “sugar” to describe HFCS, a product that is a syrup, would not accurately identify or describe the basic nature of the food or its characterizing properties. As such, using the term “sugar” would not be consistent with the general principles governing common or usual names under 21 CFR 102.5. HFCS has a negative connotation. Many consumers are aware of the health risks of this industrial sweetener, but many still do not avoid it. At least by requiring the CRA to maintain the current name on labeling, consumers will not have the wool pulled over their eyes if looking.